November is Caregiver Awareness Month. Caregivers face many unique experiences as they shadow their loved ones in their treatment journeys. From loss of sleep to poor eating habits to sudden crying spells and beyond, caregivers face many lifestyle changes that impact their stress levels and ultimately, their wellbeing. Find a care navigator. A care navigator can help you assess your loved one’s medical and personal needs, identify and select treatments and calculate associated costs, assist with legal processes and much more. Set aside time for nourishing social activities. Do you belong to a book club? Like yoga? Play golf? Whatever it is, ensure that you set aside time to continue social activities that bring you joy. Rely on family, friends, and professionals for “time-outs” in your caregiving routine. Private and group services are available to care for your loved one on an hourly or daily basis and give you time to refresh. And do not feel guilty about accepting help from family and friends – they are often more than eager to assist you. Accept the range of emotions that come with being a caregiver. Allowing yourself to feel grief, frustration, fear, and sadness can relieve emotional pressure. Learn from other caregivers (via social-media groups, peer-connecting organizations like Imerman Angels, counselors) that you are experiencing very normal emotions. Remain organized. Store all related paperwork in a neatly arranged central location so that you can quickly find it for any treatments, questions or billing issues. Keeping everything in one clearly labeled three-ring binder, or even organizing it according to categories in multiple binders, is one way to keep all of the information straight. Meditate or practice mindfulness. Many studies have shown that daily meditation practices, even for just 10 minutes, help reduce stress and instill a sense of peace. Honor the difficult moments, and let go of guilt. You are human, and you are doing the best that you can. Caregiving is an enormous responsibility and can become draining at times. Do not shy away from accepting moments of fatigue and speaking up when you need help. 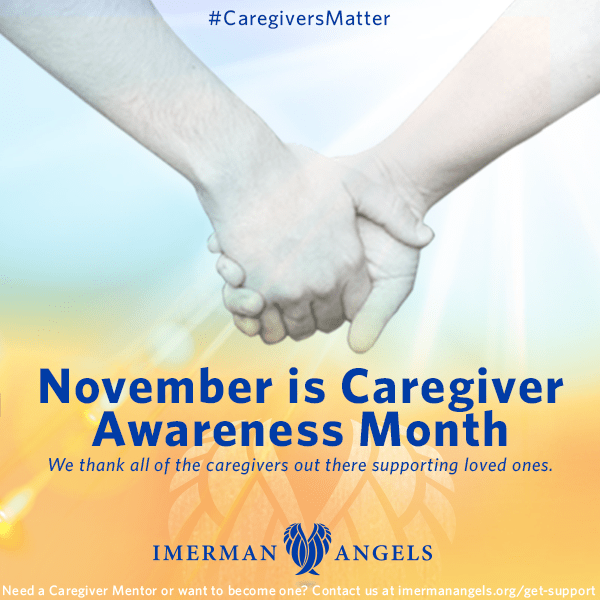 Consider 1-on-1 caregiver support from Imerman Angels. We recognize the vital role of caregivers as well as the strain cancer places on you, and we have Mentor Angels who are eager to help. Moreover, you can be paired with someone that shares characteristics that are important to you (for example, the cancer type of your loved one, your age, gender, faith, and family structure). These 8 ideas for nourishing yourself as a caregiver are just a start. Of course, there are others that reduce stress and ensure wellness. But the bottom line is this: it is critical you do not overlook your own well-being while caring for a loved one with cancer. By taking care of yourself, you will maintain the physical and mental health required to provide them with the highest level of care.